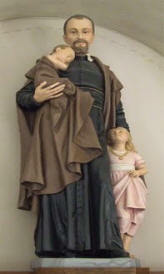 St. Vincent was born on April 2nd, 1581 near Ranquine, southwest France to a peasant family. He was a highly intelligent youth. The town is now known as Saint Vincent de Paul, Landes, France. He was the third son of the farmer Jean de Paul. The children of farmers of the sixteenth century had no time for diversion since they had to work in the fields during early childhood. St. Vincent had to take the cattle to pasture: the sheep, the cows, and the pigs. He had to lead the animals to the plains and forests for them to find pasture. St. Vincent did this everyday, barefoot and with humble provisions. As a youth Vincent was alert and his father had ambitious plans for him. He was sent to the Franciscan School de Dax 5 kilometers from de Pouy, the farming village of the region. Dax is a prosperous city of wide streets and beautiful mansions. St. Vincent was happy with his studies and desired to leave his farm life. He felt ashamed of his origins and of his own father. After four years of studies in Dax he went to the great city of Toulose. His father had recently died in 1598. At the age of seventeen St. Vincent received the tonsure and the minor orders. His father had left him part of the inheritance to pay for his studies, but he rejected it, preferring to work for it himself. To make a living he taught humanities in the de Buzet School and continued at the same time his studies of theology. In 1598 he received the subdioconate. On September 23rd, 1600 in Chateau-l’Eveque he was ordained a priest by the elderly Bishop de Perigueux. “ If I would have known, as I know now, what the priesthood was when I accepted it, I would have preferred to dedicate myself to the work of the land before entering such a fearsome state,” he wrote later. The Bishop of Dax offered him a parish, but apparently there was another candidate. St. Vincent refused, and preferred to continue his studies and aspire to higher positions: to become bishop. In 1604 he obtained his Doctorate in Theology and went to Burdeos. He then made an interesting trip to Marseille. There an elderly woman from Toulouse left him an inheritance of 300 escudos to return to Toulouse through Narbona. In Marceille St. Vincent embarked for Narbona. However, the ship was attacked by the Turks, so he was imprisoned. The years 1605-1607 were truly a mystery. It is said he was sold as a slave and was at the service of four different masters: a fisherman, a doctor, his nephew, and finally a renegade Christian. In 1609, after arriving in Paris, St. Vincent encountered Pierre de Berulle in the Charity Hospital, where both visited the sick. Berulle had a double vocation: healer of souls and the founder of a group of spiritual priests. The clerics were in a lamentable state after the religious wars. The Degrees from the Council of Trent in reference to priestly formation were not fulfilled ( if they would have been St. Vincent would not have been ordained at age 19 because the Council required the deacons to be 25 years old to gain access to the priesthood). Most of the bishops lived as great, rich masters away from their diocese. But a new movement began. 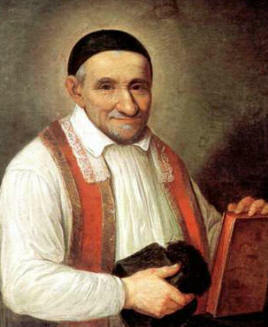 In Italy, Phillip Neri founded the Priestly Congregation of the Oratory, similar to the oblates founded in Milan by Carlos Borromeo who desired to fervently live the priesthood. Berulle wanted St. Vincent to enter the Oratory, but Vincent did not accept for various reasons. However, he did accept the proposition to replace a priest who had wanted to enter the Oratory. Therefore in May of 1612, St. Vincent took charge of a parish “Clichy la Garenne,” near Paris. The parish had 600 parishioners of a semi rural character. Most of the residents were farmers and St. Vincent was pleased. Here he taught catechism and repaired the furniture in the church. He had already been a priest for 12 years and it was the first time he practiced his priestly ministry. Berulle, who continued dreaming great things for St. Vincent, named him teacher of the well-known family de Gondi, Phillipe de Gondi, nephew of the Archbishop of Paris. St. Vincent arrived there on September of 1613. “ I was sad to leave my small Church de Clichy,” he wrote to a friend. St. Vincent gave some courses and lessons to the rich children of Montmirail, in Joigny, Paris, Folleville. He could have been happy. . . but he was not. During the numerous trips to Gondi, he came into contact again with the farmers and the poor people who lived in the servant’s quarters of the noble family. He realized that this is what interested him the most. In 1617 two events transformed his life and gave him peace of soul. These were occasional events, not prolonged self denials or considerations. In the beginning of 1617 St. Vincent visited an agonizing person in Gannes, in the district of Oise, near the palace of the Gondi family. This agonizing man who had fame of being a good man revealed to St. Vincent sins he had never dared to reveal to other priests due in large part to shame or self love. On January 25th, 1617 from the pulpit St. Vincent proposed to all the faithful of Folleville the idea to go to the priests and make a general confession of their lives. This first event marked the life of St. Vincent and his vocation. That winter of 1617, St. Vincent encountered face to face an agonizing person who experienced extreme moral loneliness. He would suffer the cold weather all night and felt the impossibility of talking to God. This man who was about to die still had not found a sweet priestly look that would allow him to step out of himself and believe in the gentleness of God. Here is where the heart of St. Vincent’s vocation was found: gentleness. His heart was touched. He desired to go to the farthest places and tell all those who find themselves lost that God exists, that He is a God of gentleness who has not forgotten them. The proof is that this priest went to them and heard them with a gentleness that caused them to think of the gentleness of God. St. Vincent no longer wanted to remain with the Gondi family, so he notified Berulle of this on May of 1617. He was installed as Pastor on August 1st of the same year in a small parish between Lyon and Geneva, in the region of Bresse, Chatillon-les-Dombes. There he had a second experience that, like the one in Gannes, marked the life of this man of 36 years. St. Vincent started his work and on August 23 he read in front of some women a text constituting a program to aid the sick. Their hearts were subsequently touched upon hearing this. The text would become the subsequent foundational texts of the “ Confréries de Charité” ( Brotherhood of Charity). The Gondi family and Berulle desired that St. Vincent would reinstate his position and resume his functions as chaplain and teacher. Thus, they call him back to Paris. St. Vincent arrived at the Gondi household on Christmas Eve in 1617. St. Vincent had found his path, the way of compassion and gentleness for those suffering abandonment. He utilized his position as base for operations, and established his small charity associations. In November of 1618 he encountered St. Francis de Sales in Paris. This holy Bishop of Annecy was 51 years old and had published two years prior his book entitled: “ Treatise on the Love of God.” St. Francis de Sales was known for his immense gentleness and his sermons to Protestants, and for his kindness to the poor and the sick. He gave all to the poor and even what was not his he borrowed to help. In 1610, St. Francis de Sales founded the Visitation Order, a religious congregation of women. His desire was for the nuns to be contemplatives, but to consecrate themselves to the care of the sick. The first nuns of the Visitation were in charge of caring for the sick. At the arrival of St. Francis de Sales to Paris, he was the object of an enthusiastic reception. With his evangelical and simple words he met Mother Angelica Arnauld, Berulle and St. Vincent de Paul who was impressed by his gentleness. It is impossible to imagine the enthusiasm awakened by St. Francis de Sales in Paris and all over if we do not take into account the situation of the west in the beginning of the 17th century. The population was afflicted by great evils, provoking enormous traumas; anguish and desperation are generalized, and the Church pointed out the diverse scapegoats. The Turks, the witches, the Jews, the heretics . . . . and most importantly the danger of losing one’s soul. St. Francis de Sales, robust in gentleness, sent a message to free the people from fear and from appealing to vague remedies, but instead to realism and to the common sense of man. For the people at the beginning of the 17th century it was an immense invitation for hope. This efficient message put into practice showed men that real human gentleness comes from God, and at the same time God’s gentleness is much more superior to all human gentleness. This was the secret of the life of St. Vincent and St. Francis de Sales. Their God is a God of gentleness and goodness, and having experienced it, they desired to transmit it through their own lives. For St. Vincent de Paul, St. Francis de Sales was always a point of reference. On the other hand, St. Francis de Sales, who had recognized the virtues of St. Vincent, asked him to be the Chaplain of the Visitation Sisters in Paris, and to be Jane de Chantal’s spiritual director. galeotes were the poorest of the poor. St. Vincent first visited them in the dungeons of La Conciergerie, an old prison where he encountered a man dominated by hate and desperation. He asked and obtained from M. de Gondi for this man to have better human treatment. The Chaplain of de Galeras then went to Marseille, where the galeotes were more numerous, and presented himself as “unknown” to them. He entered the place where they were and was terribly impressed since “it was the saddest sight you could imagine,” and, “ a real image of hell. . . wounded by deep sentiments of compassion for those miserable people, I myself tried to console and assist them the best way I was able to.” St. Vincent was not limited to only good words, but he put them into action and sought to improve the framework as well. St. Vincent was converted at a time of a long series of crises in Europe. The Thirty Years War started in 1618, at the logical conclusion of an enormous crisis which originated in the opposition between Catholics and Protestants. This ideological crisis of Christianity opened the way for two adverse reforms ( Luther and Calvin, and the Council of Trent). This crisis has to be seen within the general context of the 16th century crisis. The elaborated doctrine of the Council of Trent against the Protestant thesis rehabilitated human nature, and it lead in a logical method to the sacraments. The Council also asked the priests to preach the Gospel. The application of the Council degrees required time, and St. Vincent referred to them constantly and worked hard for them to be put into practice. Wars continued, taxes were tripled, and the poor continued to be the ones who lost the most. The misery was terrible. A priest from a mission arriving at Champagne wrote to St. Vincent: “ There is no tongue to express it, no pen to write it, no ear to dare hear what we have contemplated since the first few days of our presence in these lands . . . . . All the Churches and the most holy mysteries have been profaned; the ornaments are sacked; the baptismal fonts are destroyed; priests are assassinated, tortured, and obliged to flee; houses demolished; the crops stolen; the fields are without crops and laborers; hunger and loss of life are almost absolute; the bodies are without burial and for the most part are food for the wolves. The poor that survive this ruin are obliged to pick up from the fields the grains of wheat or oat which are semi-rotten. The bread able to be made, if any, is like clay, and the life to be lived is insane, that it seems almost like a living death. Most of the sick are hidden in miserable shacks or caves, and we don’t know how to reach them. Most of them are lying naked on the floor or on rotten straw, with no more clothing than miserable rags. Their faces are blackened and disfigured, they look like faces of ghosts, and not men.” St. Vincent sent 12 of his priests to organize help there. There was only one way to put an end to the misery of the population: peace. St. Vincent did not doubt it one minute: he confronted Richelieu and asked him to put an end to these enormous conflicts. St. Vincent wanted priests for the “ mission” to be sent to rural areas. The Congregation was founded on April 17th, 1625 and recognized one year later by the Archbishop of Paris. The first missionaries signed the association document on September 4th, 1626. The difficulties started. Mr. Gondi, influenced by Berulle, had the intention of taking away the money given for the foundation. St. Cyran tried to dissuade him. Rome, because of Berulle, rejected the approval of the Mission Congregation twice. Eight long years had to be waited for the approval in 1633. On July 1628 the Bishop de Beauvais asked St. Vincent to go to his dioceses and give a retreat to future priests. The Archbishop of Paris also thought of the formation of future priests, and in 1631, offered St. Vincent a group of buildings much more important than the “ College de Bons-Enfants,” the old leprosy ward of St. Lazarus (given to the priests of the Mission with the name Lazarists). The Archbishop’s wishes were that St. Vincent contribute to the reformation of the priesthood and serve in the formation of future priests. In the 17th century, two types of reformers of the clerics existed, but St. Vincent preferred above all the practical formation, according to the most experimental method. What worried him most was the concrete situation of priests. Saint Lazare became the concrete center of encounters or meetings: every Tuesday the priests met there, dedicating themselves to prayer, reflection, and hearing St. Vincent in his famous “ Tuesday Conferences.” In his audience there were 22 future bishops who received their formation form the angelical lips of St. Vincent de Paul. From 1630 -1650 France was going through a difficult period of disastrous wars. St. Vincent looked forward to the difficulties of his time, refused to close his eyes, and fought against the misery of the people. This misery impeded men to live as human beings. with fevers and infections. On the other hand, large numbers of orphans were continually given to the care of survivors and later adopted for a while by a community within the village or slums, until their fathers remarried. In 1617 St. Vincent started the foundation of his “charites.” Some took care of the homeless, others of epidemics, others fought against contagious diseases, and others were dedicated to different calamities. The “ charites” multiplied; they needed supervision and coordination within the same spirit. Therefore, St. Vincent asked a young widow of 38 years old, Luisa de Marillac, whom he had known for four years, to help and visit the undetermined number of “charites” in 1629. She reached the place of an established “charite,” and united the women there to examine the problems and to teach them how to heal the sick and manage a proper administration. With the Pastor’s approval she reunited the young women of the parish and catechized them. She did all this despite poor physical health and deficient conditions. She was a very fragile woman, psychologically delicate, with scarce economic means. Before sending her, St. Vincent had educated her for four years, instructing her in the joy of God, the gentle control of self, the acceptance of contradictions and abandonment in God’s Providence. St. Vincent said to her: “ Follow Him, don’t try to go before Him.” The fruits of Luisa’s and St. Vincent’s activity were that everything went well. In the 17th century a religious fervor ignited. The women, in particular, felt attracted to life in the convent and many new foundations emerged. Many were founded by the young or widows of the nobility because they had sufficient money to buy the convents. St. Vincent wished that his “ Daughters of Charity” be in the world. However, this was not easy to acquire. To lead this program St. Vincent decided not to depend on the ladies of rich families who were able to give large sums of money, but instead on the simple village girls. The beginnings were very modest: four young ladies were recommended by St. Vincent on November 29th, 1633 to Marguerite Nasseau, who received them in her house and put them to work in a small hospital she herself founded. Luisa de Marillac was in charge of teaching them nursing skills and instructing them in their spiritual life. For St. Vincent prayer came first. He would mention the text from the Acts of the Apostles where it mentions that Jesus “ acted and taught.” In this he based the priority of action. St. Vincent encountered the Jansenists. Jansen had just finished writing his ‘Augustinus’ in 1628. Rome condemned it in 1641, but St. Vincent had opposed it before its condemnation. Instead of creating tension and permit God to adapt to certain molds for the soul, St. Vincent opposed the Jansenists’ and did not cease to propose the tranquil abandonment to God. Grace has its moments. Let’s abandon ourselves to God’s Providence and be on our guard not to go before it. St. Vincent was an enemy of excessive activity, but we can affirm that if he did so many things it was because he had time for it. Since 1645 he personally dictated 10 letters per day with the help of two secretaries. Also, he closely followed the activities of all the houses of charity and all the priests of the Mission; he was an influence for vocations and opened new houses in Genova, Turin, and Rome. In 1646 the house in Argel was founded (where an epidemic would start in 1647) and the congregation was asked to aid Moroccans; that same year priests were sent to Ireland and Scotland. In 1648 a group of missionaries went to Madagascar. In 1651 another group went to Poland and in 1660, just before his death, St. Vincent comes up with a project for the missions in America and China. Between 1650 and 1660 three regions of France needed help: l’ le-de-France, la Champagne and la Picardie. These towns were sacked and devastated by soldiers. Since 1652 the aftermath of the war affected all the French families. But St. Vincent continued his activity without rest, always giving of himself. The only things he required of his people were goodness, perseverance, and sweetness. In 1660 St. Vincent was 79 years old. Ever since that far-off day of 1617 when he decided to put himself at the service of the poor, that is, for these past 43 years he did not stop sacrificing himself for them. His schedule did not vary; he woke up at 4:00 am and went to sleep at 9:00 pm. The day consisted of three hours of prayer, three and a half hours of what he called “ various,” and nine and a half hours of work. His life was constantly marked by this slow, regular, and consistent work that resembled the work of the farmers of his time, the ones he grew up with. St. Vincent had the temptation of leading a life very different than this life of work. Until he was thirty-six years old he did not convert to the service of the poor and this style of life. In the 17th century men were divided in two classes: those who could live without having to work, and the majority of the rest. St. Vincent was about to opt for the non working class. He had a good mind and with his intelligence he could have become a benefactor. St. Vincent, however, turned his back to this style of life for two reasons: his fidelity to his origins and the love of Christ reflected in the poor moved him to opt for the Gospel. In April 18, 1659, one year before his death, St. Vincent wrote long meditations on humility, a virtue which he introduced as the first quality of a priest of the Mission. In July 1660 he was obliged to become bedridden. All his life he had been a strong and robust person; the typical farmer, short in height(1 meter, 62 centimeters) and he had enormous resistance. Between July and September of 1644 he became gravely ill. He recuperated but was prohibited from riding on horse back since his legs were very swollen and he had to walk with a cane. During the winters of 1658 and 1660 the cold reopened the wounds of his legs and, little by little he was unable to walk. He stayed in Saint Lazare amongst the poor. His heart and spirit were alert, but in September, his legs started to ooze again and his stomach was unable to intake food. On Sunday September 26th, he was taken to the chapel to assist Mass and receive Holy Communion. In the afternoon he was completely lucid when he received the Anointing of the Sick. In the morning he gave his final blessing to the priests of the Mission, the Daughters of Charity, the abandoned children, and all the poor. He died on September 27th, shortly before 4:00 AM, the time at which he used to wake up to serve God and the poor. In 1712, 52 years later, his body was exhumed by the Archbishop of Paris, two Bishops, two promoters of the faith, a doctor, a surgeon and a number of priests from his order including the Superior General, Fr. Bonnet. When the tomb was opened everything was intact. Only the eyes and nose were a little deteriorated. Eighteen teeth were counted. His body had not been moved; he looked complete and the cassock was not damaged. There was no odor and the doctors testified that a body cannot be preserved by natural means for so long. St. Vincent was the man who renewed the Church in France by motivating the clerics. The Congregation of the “Paules” became the most vigorous order in France before the French Revolution with 6,000 members in 40 provinces. Through the centuries the Daughters of Charity have helped numerous disabled and poor people: abandoned children, orphans, sick, wounded, refugees, prisoners, etc. This simple and discrete service to our neighbor constitutes the principal foundation of all the Associations of St. Vincent.